Today’s featured plant is Velvetleaf, Abutilon theophrasti. 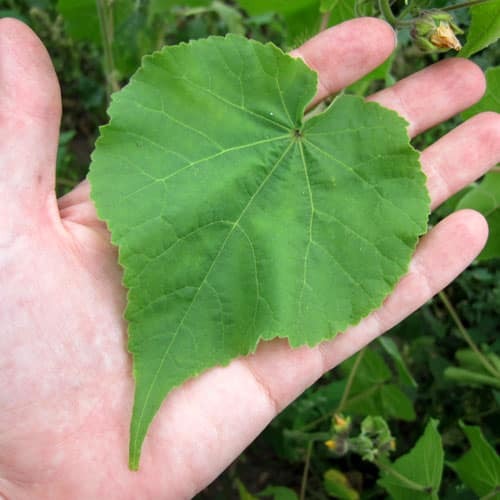 Velvetleaf is also known as China Jute, Buttonweed, Butterprint , Indian Mallow, Piemarker, Wild Cotton, abutilon, elephant ears, cottonweed, abutilon hemp, Manchurian jute, and American jute . rope and cloth, velvetleaf was widely cultivated in the mid-1700s. Although attempts to process velvetleaf fiber never succeeded economically, U. S. farmers continued to cultivate it for more than 100 years. Velvetleaf is now found through almost all of North America, except for the extreme north (see map). It's found in field, along roadsides and railways, in gardens and waste areas. It's an annual with a deep tap root. 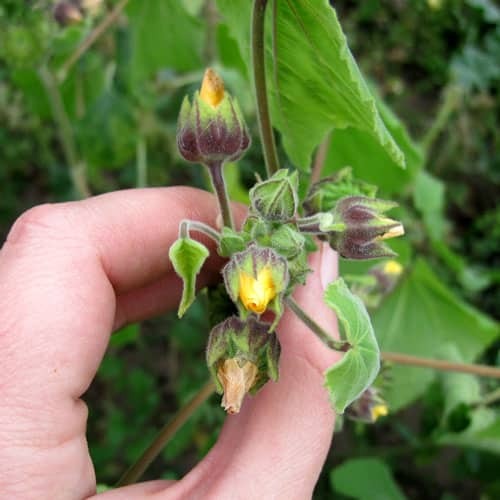 With up to 17,000 seeds per plant, velvetleaf is quite prolific. www.wssa.net explains why many farmers hate this plant and now consider it a noxious weed. 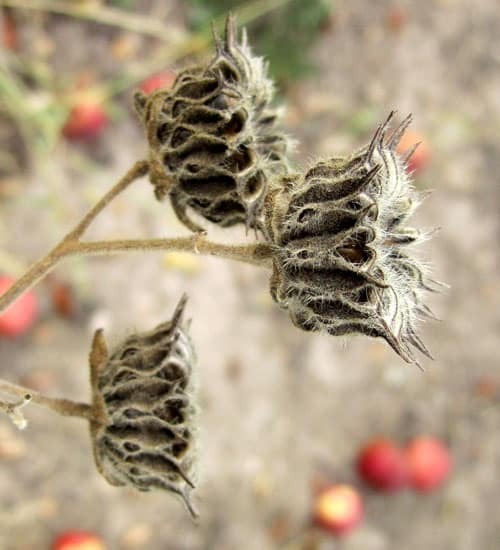 Velvetleaf seeds have tough seed coats which protect them against digestion by farm animals; in fact, experimental germination of velvetleaf seed requires scarification with 1 M sulfuric acid for 15 min or boiling for 1 min (9). Seeds can remain viable for 50 yr when stored in the soil (12); one researcher reported 43% germination after 39 yr of burial (11). The seeds and seed coats also have chemicals and microbial agents which inhibit growth of bacteria and fungi. 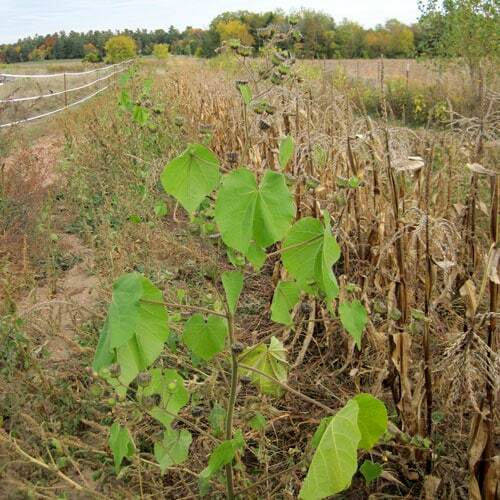 Velvetleaf plants are tall and leggy, reaching up to 8 feet tall, but most plants are in the 2-4 foot tall range. The leaves are heart shaped, and soft and velvety to the touch. In a pinch, the soft leaves can be used as a toilet paper substitute. (Do be careful – some people may get an allergic skin reaction from the plant.) This leaf is about half as big as I've seen them get – they can reach near dinner plate size. The flowers are small, yellow, and rather inconspicuous. You can see some open flowers on the Wisconsin Master Gardener site. I caught these late in the day so they were closed. 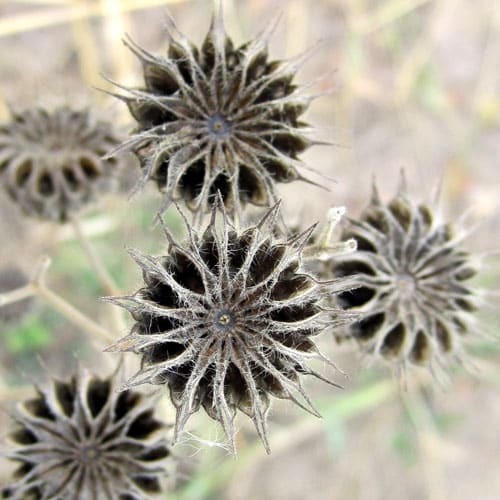 The seed heads are quite lovely. They are about an inch across. 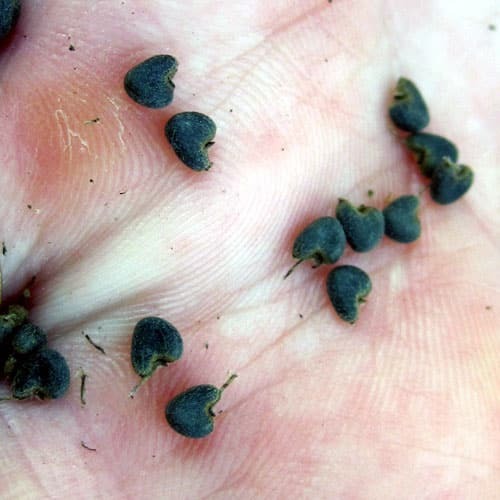 The seeds themselves are small, dark and heart shaped – and very tough. They are roughly 1/8″ across. In the U.S., the prairie deer mouse (Peromyscus maniculatus) and the white-footed mouse (Peromyscus leucopus), eat 70-90% of the seeds produced in Iowa corn fields, and likely they or similar rodents do the same elsewhere. Many insects also feed on the seeds, especially the native scentless plant bug (Rhopalidae) Niesthrea louisianica, whose immatures and adults feed on seeds of malvaceous plants. Inundative releases of this bug were used for biological control in New York and four midwestern states, resulting in a significant reduction in seed viability in the areas where it was established. The University of Tennessee says the seeds are also eaten by mourning doves and quail. The nectar and pollen of the flowers attract various kinds of bees, including bumblebees, leaf-cutting bees (Megachile spp. ), miner bees (Melissodes spp. ), and Halictid bees. Occasionally, small butterflies and skippers visit the flowers for nectar, while Syrphid flies feed on the abundant pollen. Two insects feed destructively on VelvetLeaf. The caterpillars of Pyrgus communis (Checkered Skipper) make folded-leaf nests from which they feed, while a scentless plant bug, Niesthrea louisianica, feeds on the floral buds, flowers, and seeds. The seeds are commonly eaten in China and India. I tried some myself today. they have a rather nutty flavor, and are easier to chew than sunflower seeds. Wikipedia says the leaves are edible, but I don't always trust their info. As always, any medical information is for informational purposes only. Always exercise caution when using any wild plants and make sure you have positively identified the plant. You can check out my favorite wildcrafting books for more help. Mountain Rose Herbs stocks many of the herbs and plants featured in the Weekly Weeder. They also carry an assortment of bottles, droppers and other supplies, plus some really soft organic cotton t-shirts. In college I took a class called ‘Flora of the Great Plains’. My professor told me that a common name for this plant was ‘Butterprint ‘ because people would press the seed heads into pats of butter. I think it was done for fancy dinner parties. I see this all along the edges of corn and soybean fields and pretty much anywhere the soil gets disturbed. I had wondered about the butterprint name, but hadn’t come across a reference. Thanks! I read that the seed pod was used to make decorative designs on butter in some cultures. The blog post I have decided to feature is: “Plums to Prunes, Chicken to Dog Treats”. We all know what plums and prunes are good for, and for those of us that are iron deficient anemic and are on high doses of iron, the things are a God-send. I have one of these growing in my raised bed with melons & other things. So glad to find out what it is! Thank you for the good article! Hi, I am from the Invasive Council of B.C. I am wondering if you have the rights to the pictures for Velvet Leaf…and if so , would it be possible for us to use them on our website? Yes, I have the rights to the photos, as they were taken in my yard by me. You may use them with proper attribution and a link back to the site.